You’ve got to be a little cynical to love the movies. There’s a part of you — or me, anyway — that wants to be surprised but expects to be disappointed. You want something that at least feels new, even if we’re just talking about reupholstered oldness. But two new movies — Pete Docter and Pixar’s Inside Out and a film about young, hearing-impaired mafiosi called The Tribe — sit at opposite artistic poles yet meet in an amazing middle: They’re both interior stories. They both remind you, in their respective ways, that the movies can still show you something not only that you’ve never seen but that you never expected to see. On its surface, there’s not much to the Pixar film. An 11-year-old Minnesotan named Riley Anderson (voiced by Kaitlyn Dias) is dragged along with her mother (Diane Lane) to San Francisco because her dad (Kyle MacLachlan) has a shaky-sounding new tech job. It means no more hockey, a new school, and a flood of mixed emotions. But Inside Out keeps leaving that surface of her everyday life, cutting away to the heart of the movie: a vast warehouse of orb-concealed core memories in Riley’s brain staffed by five elemental emotions that have been personified and color-coded. Disgust (Mindy Kaling) is bright green. Anger (Lewis Black) dresses like a comic-book newspaper editor and is built — and hued — like a fire hydrant. Fear (Bill Hader) is purple, nerdy, and insect-thin. Sadness (Phyllis Smith) is a blue teardrop in black glasses, a white turtleneck sweater, and a terrific side-parted pageboy; she’s like Velma from Scooby-Doo with self-esteem too low to realize a dream of selling messenger bags on Etsy. They all more or less stand behind a control panel overseen by Joy (Amy Poehler), a plucky, cheerleading go-getter whose yellow skin most resembles a human’s and whose outlook and haircut most recall Tinkerbell’s. Each emotion thinks it serves a purpose for Riley. Joy presumes that hers is the most meaningful, especially after the move to a skinny, drab San Francisco Victorian. (This is the second movie in the space of a month, after San Andreas, that refuses to see even a visual upside to this city. And Pixar lives in Emeryville!) Indeed, most of the memory orbs glow yellow. They do so in a way that suggests Joy is winning the life of Riley at the expense of the other emotions. There’s reason to fear that Docter and the multitudes working with him will prize Joy as a leader more than her coworkers. She certainly thinks as much of herself. And for the first 20 minutes or so, the writing has a good time letting the emotions coexist and banter with each other. But the adventure begins when Sadness’s sense of her own superfluousness leads her to touch some of the orbs, turning them blue and raising the volume on Joy’s control-freak politeness. This is a rightly complicated world. The movie divides Riley’s personality into a quintet of memory-driven islands — Family Island, Hockey Island, Goofball Island, etc. — that bridge out from the control room and have the pinwheeling, pop-up-book look of advertisements for amusement parks.1 Sadness touches a particular orb and turns one of Riley’s happy memories sad, which makes her cry in class. Joy and Sadness tussle, causing core memories to come loose. The memories, along with Joy and Sadness, are sucked up into a tube and deposited in the outer reaches of Riley’s brain, resulting in the comedy of Disgust, Anger, and Fear trying to maintain order back at headquarters. The challenge here involves maintaining a believable humanity while also making an entertaining case that humanity is impossible without the proper emotional configuration. And in meeting that challenge, the movie keeps surprising and delighting you. When Riley’s truculence starts a spat between her parents, the film shifts to their respective headquarters, which are reductively gendered. Yet the reduction is vivid, clever, and, most importantly, hilarious. Every time the movie returns to that device, among the humans and some pets, you crack up. The filmmakers have the most fun with that idea and its universality. It’s low-risk, high-yield comedy, but they’ve so thoroughly realized these private emotional systems that you can’t believe each of them doesn’t have its own internal control room. Meanwhile, Joy and Sadness have to find a way back from the expanses of Riley’s long-term memory, which rings a moatlike abyss where old, vestigial memories go to die. If they fail, Riley’s memory islands will collapse and presumably some kind of Alzheimer’s will set in. The moments when some of these bright islands do go dark feel more shocking than anything in most disaster movies. But the trip allows Pixar’s ingenuity to flourish. There’s one joke here involving the functional necessity of a boy that is one of the best gags in any of these movies. There’s also a forgotten imaginary playmate called Bing Bong (Richard Kind, beautifully milking the poor guy’s resigned buoyancy) who tries to help Joy and Sadness get home. The adventure doesn’t entirely hang together as a movie. Or rather: For a stretch, the physical action protracts the concept rather than enhances it. Some of Joy and Sadness’s struggle to get back is a slog for both them and us. It feels as if the colors are dimming and the movements are submerged in something almost amniotic. In truth, they’re just walking and running and, eventually, falling into that pit of discarded memories. But as they wander fretfully through candied gloaming and attempt to climb out of the depression of that abyss, the movie presents its own abstracted version of the Slough of Despond. That guilt doesn’t belong to Joy or Sadness. It’s a strange, unconscious despondence over all the accumulated waste in a life — where’s the line between instrumental and excremental? This girl is 11. I can’t imagine what’s in the abyss of her parents. But this is where your mind goes during this movie: to the pricelessness and preciousness of time, to a consideration of the unknowable zones of human consciousness. And confirming what goes on as we live is actually as impossible as truly knowing what happens after we die: We know and yet we don’t. Pixar’s attempt to render this is a bit boring, but perhaps boring in the way that certain master directors, like Andrei Tarkovsky, can be boring: as a dare to contemplate existence and time. With Pixar at this point, eliciting boredom might be a showoff move — the way Toni Morrison can give you two full pages of run-on lists or Serena Williams will close out a championship match with four straight aces. It can do this and still give you a very good movie. Your boredom is, for Pixar, principled — fleeting, too; a break from laughter or widened eyes. I preferred the slowness to the goofy stuff at the climax. Generally, sadness tends to be the object of fear, anger, and disgust. Here it’s a base, and Smith is marvelous at bringing it to life. She speaks in the flatland cadences of the American Midwest, a grandmother-librarian who’s never at the center of anything more cultural than a family portrait. Smith, who played Phyllis on the American Office, is a glorious contrast to Poehler’s heroic pep. I found Sadness’s wimpiness and dumpiness annoying initially. But the movie gets behind her self-doubt until it’s empowered. You’re rooting for the movie to take what she represents seriously, and it’s moving when it finally does. The best of Pixar reckons with states of existence and questions of the soul — what makes us human, whether we’re rats, unwanted robots, or made of plastic. 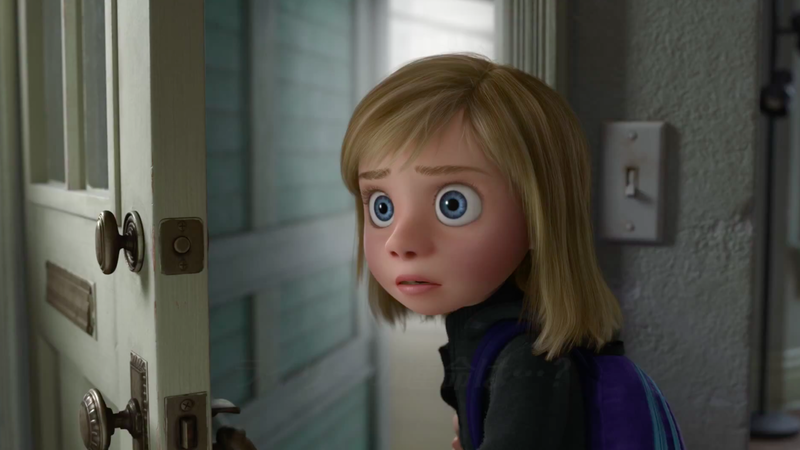 Inside Out might be the most improbable of all of Pixar’s films, since it’s the least external and least explicable. But its unquenchable curiosity also puts it among the most wondrous of its ilk or any American film. This is a studio that has always cherished moods — presented them in phases, not as swings. More than once, I wondered where Inside Out would go. Given the surplus of color and the honest range of feeling, the answer is as much under the rainbow as over it. Inside Out is verbalized. The Tribe is gesticulated. It’s an utter astonishment set at a Ukrainian boarding school for the deaf. The building that houses these kids feels like a bureaucratic annex: large, forbidding, creaky, rid of comfort and love, rottenly corrupt. It makes anything in Dickens seem like an episode of Captain Kangaroo. And like most of what comes our way from Eastern Europe, the movie doubles as an allegorical X-ray of national spiritual decay. The story is as simple as Pixar’s. A shy new student (Grygoriy Fesenko) gets mixed up in the organized crime that infests the school and spills beyond its walls. The story visits seemingly endless rows of parked tractor trailers for the nightly pimping and prostitution of two merry-but-hardened female roommates — a plate-faced blonde (Yana Novikova) and a frowning brunette (Rosa Babiy) — by their boyfriends. Other extracurricular activities include the beating and robbery of strangers and the new kid’s natural but morally misguided attachment to the blonde. The scenes come in plain, signed dispatches that writer and director Miroslav Slaboshpitsky has opted not to translate or subtitle into any language. For a hearing audience, this gives the movie its cinematic complexity. The actors are deaf, so the signing, perhaps with the director’s encouragement, becomes intoxicatingly elegant. And over the course of the film’s 132 minutes, as the characters and behavior and story cohere, the elegance becomes unbearable and ugly. The entire time you’re watching a silent film. The sounds of slapping flesh and rustling fabric and rooms being tossed in desperate rage become a soundtrack. This is to say that, in addition to a silent film, The Tribe is also a musical. Slaboshpitsky began his career as a crime reporter, and a movie like this makes you eager to read his prose. Each scene is a paragraph of action, presented in a single take in which the actors fill the space with sour charisma and sharp and lilting hand motions. The smooth camerawork, by Valentyn Vasyanovych (who’s the editor, too), is a creepy wonder, sitting stock still, then pulling out to create tracking shots as graceful as the sign language. The bodies tell the story the way they do in modern dance, but upside down, with arms and hands doing the work of legs and feet. Some of the movement — an early classroom scene, an outdoor fight not much later in which the new kid is overmanned — feels straight out of Bob Fosse: gorgeous, dangerous, psychological. There’s a long, grim interlude at the apartment of an abortionist that feels like something out of a nightmare ballet. The woman’s hair is pulled back so tightly as she dances from her kitchen to the room in which she brutally preps her patient that you feel as though you can see her skull. There is a small but not insignificant attention to comedy, and you cling to it until it’s gone. The early scenes feel a bit like a put-on. The boys all wear dark suits and white shirts. They look like they’re auditioning for Reservoir Dogs. When they slip into tracksuits, it’s Goodfellas. But after a few scenes, it’s clear that Slaboshpitsky isn’t doing Bugsy Malone despite the absence of a single kind or moral adult. He’s serious. And he’s intelligent. The movie is set in a world in which sound exists, and more than once we see the dire consequences of the deaf caught unaware. A gang of kids make the new boy strip to his skivvies on his first day. But you notice that he’s in alarmingly good shape. It’s something you think about as the sociological drama turns into a thriller and the thriller turns into a horror film. That strength matters. To hear this might be to wonder why you’d want to see the film. It’s black as tar and affirming only of our grimmest selves. Slaboshpitsky guides this tale from mischief to tragedy the way one might drive a hearse. But you are in the presence of an artist who has complete control of his material in the fatless, waste-free style that Michael Haneke works. The final sequence is an appalling rush. I left the theater and had no idea which direction to walk. I was knocked out, in the way that a work of art can leave you knock-kneed, but also in the sense of being powerfully morally disoriented and dismayed. I wanted to tell the world to see this movie. I also wanted to call the police. Not unlike the ones owned by the company that also owns Pixar and this website.